The Luna Eclipse is a stunning 2.0 speaker set, with smooth curves, distinct unique design and high audio quality that Edifier is renowned for. Ideal for desktops and home environments, the Luna Eclipse is a must have for audio enthusiasts seeking an exceptional audio and visually striking experience. Connect to a Bluetooth enabled device for wireless audio streaming, or to your audio host using the 3.5mm auxiliary cable. Touch sensitive controls are located on the active speaker, for volume and power control as well as track change in a swiping motion when paired in Bluetooth mode. Each speaker unit contains a 19mm tweeter and a 3 inch full range speaker driver, producing a total RMS of 74W. In addition, each speaker also contains two 3 inch passive bass radiators, maximizing the bass performance and listening experience. The incorporation and use of Digital Sound Processing and Dynamic Range Control minimize the distortion levels even at the highest volumes, producing clear, clean audio output. 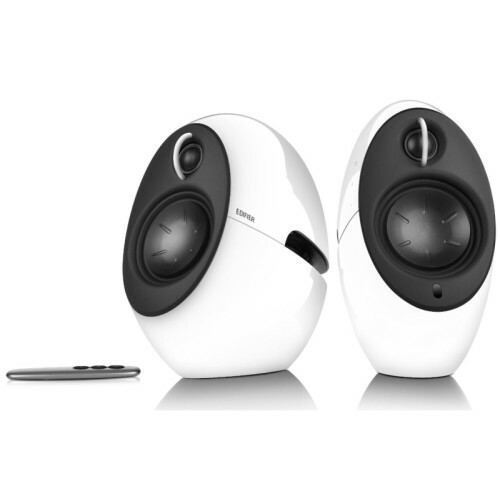 A slim, easy to use remote control also controls volume levels and power to the speakers.